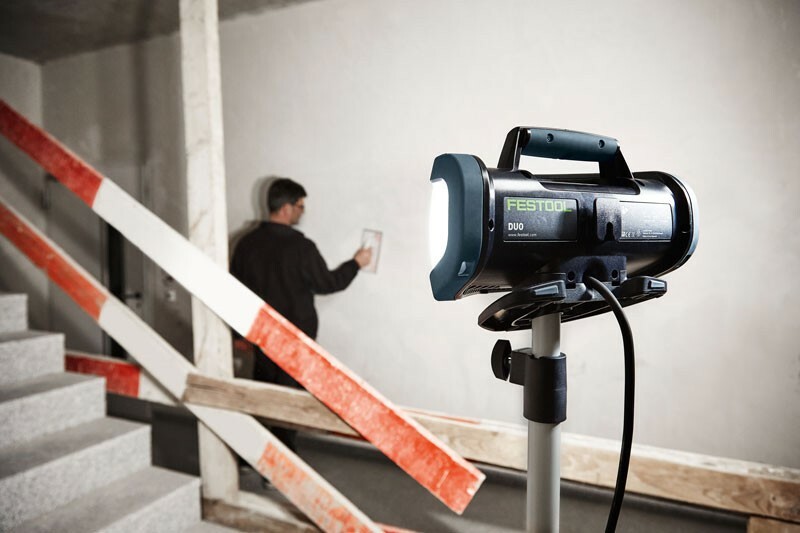 I don't know what it is about LED lights, but I am kind of obsessed with them, and when I tell you I am excited about the new SysLite DUO LED Work Light from Festool, I mean it. A lot of this excitements has to do with the insane amount of light it can put out. Most of the jobsites I am working on only have temporary lights, which typically consists of a string of light bulbs down all the major halls. As soon as you leave a hall you are on your own for lighting, which usually means using a hot halogen light in a small room. 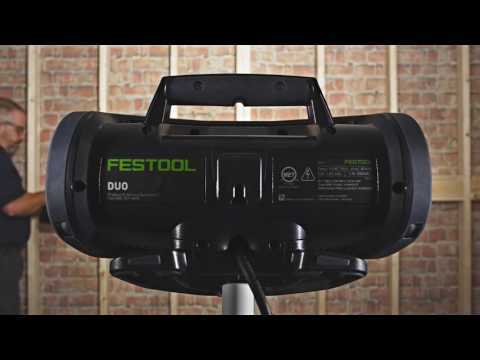 With 8,000 lumens of light and an 180-degree spread, the Festool SysLite DUO can easily light up just about any room you could put it in, and since the light has a color of 5000 Kelvin, it is almost light working under sunlight. Even the Milwaukee Cordless Flood Light can light up a room, and it is only around 1,100 lumens of light; image what 8,000 lumens can do. One of the things I really like about Festool's new SysLite DUO LED work light, is that it is corded. I like to run as many cordless tools as possible, but if I am going to be needing a light all day long, I would much rather have it run off of AC power and not have to worry about the light going out during a precision cut. All that being said, it would have been nice if the light could run off a battery, even with less light output. As Festool likes to overengineer all of their products, the SysLite has an IP 55 rating against dust and water intrusion and is housed in a tough exterior plastic shell. The 80 LED's are rated for 10,000 hours, which amounts to over 5 years of work (250 days @ 8 hours per day). There are also plenty of mounting options included on the light in addition to the base which can be screwed to a ceiling or wall. A nail hook on the back can also be used to hang the light on a wall, or the SysLite can be hung from the ceiling with some rope or wire. An accessory Tripod can also be used to make the light more mobile and height adjustable. At $300 for the SysLite DUO and $200 for the tripod (or $435 for the set), it is nowhere near as affordable as a $10 halogen work light, but if you want shadowless, high-quality low-energy, low-heat light to illuminate your projects, you are not going to find a price much better than this. Jobsite lighting is more than just putting light in a room; it is about truly seeing the surface you are working on in the correct color without hot spots in the center. The Syslite DUO is a hardwired AC lighting solution with 8000 Lumens projecting an evenly diffused light over 180° with a color temperature of 5000 Kelvin. Designed for the jobsite, the Syslite DUO is impact and water resistant meeting IP 55 standards for dust and water intrusion. Optional tripod, ST DUO 200, provides a firm and stable base that is designed to withstand years of service in the field. Couple that with the LED service life of 10,000 hours, the Syslite DUO will provide unmatched lighting for many years to come.